The lack of visitors is certainly no reflection on the beauty of this desert gem. 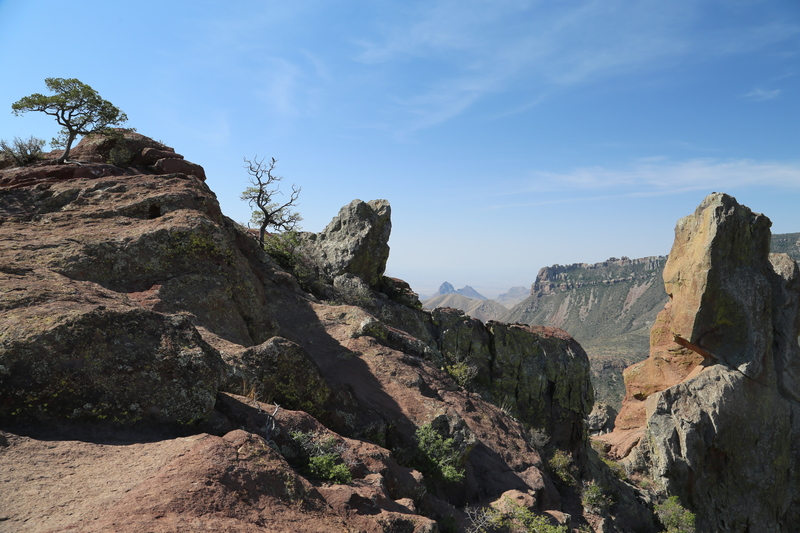 In its harsh and rugged way, Big Bend is no less spectacular than any of the other national parks we have visited; and, I am quite certain the primary reason there are so few visitors is the park’s remote location. This is not a place you just “stop by” on your way through, unless of course your final destination is The-Middle-of-Nowhere. The road leading into the Chisos Mountains, Big Bend National Park, Texas. 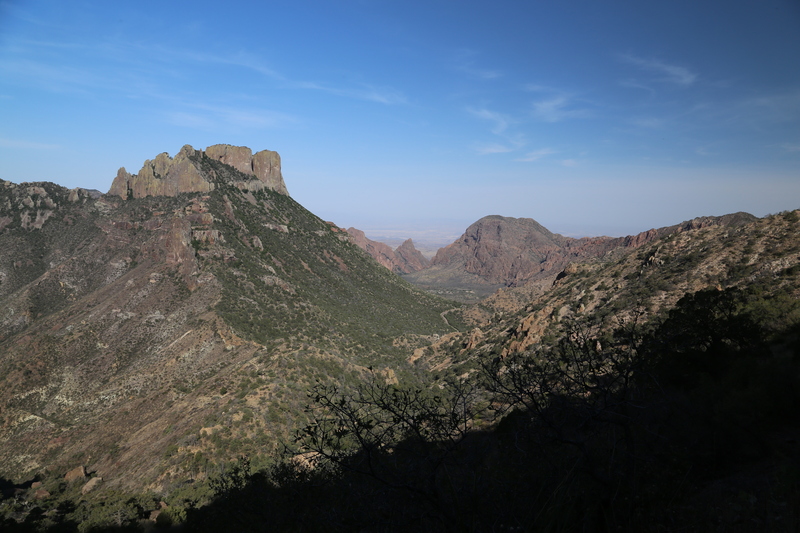 Big Bend National Park is a serious, desert wilderness! This is not the place to cut your teeth when it comes to hiking. It is very remote, with harsh terrain and extreme weather. When we visited in late May of 2014 temperatures reached as high as 116 °F during the day and cooled so much at night that we needed a fleece jacket to stay warm. While these conditions are not surprising to anyone who has lived or traveled in the desert, to someone unfamiliar with this environment it is easy to come unprepared. If you visit during the hotter season, like we did, I recommend getting up early and hiking during the cooler morning hours when temperatures are below 90 °F. Evening hiking works too, but there is less margin-for-error if you underestimate the time to complete your hike, that is, unless you want to hike after dark when the mountain lions and black bears are on the prowl. We did most of our hiking early then went back for a shower and an afternoon siesta…I now truly grasp and appreciate this concept. 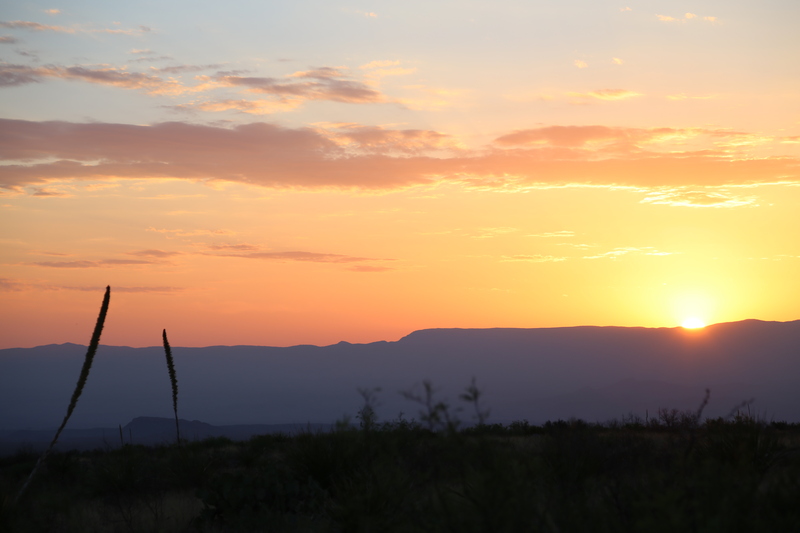 We found late afternoons were a great time to drive around in air conditioned comfort and scout the next day’s trailhead or find a perfect vista to enjoy the spectacular evening sunsets! 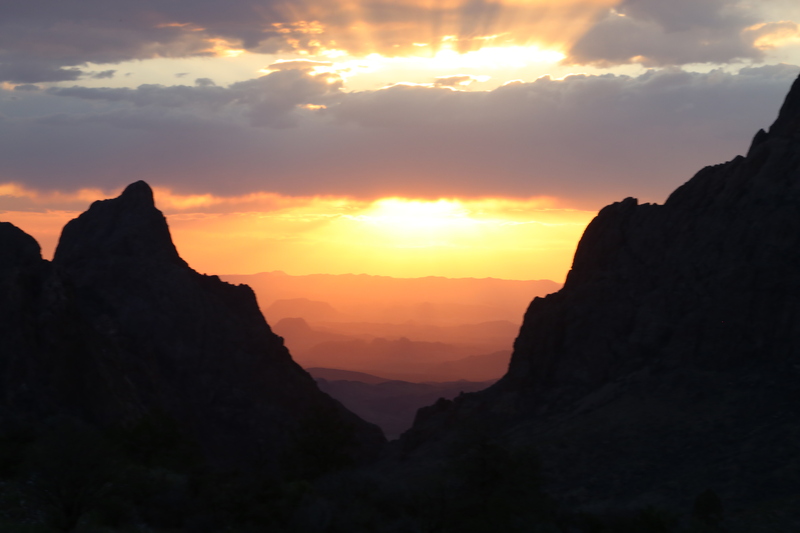 Sunset on the Window View Trail in the Chisos Basin. We also experienced a couple of pretty severe late afternoon thunderstorms and were quite glad that we were not caught out on the trail during either of them! 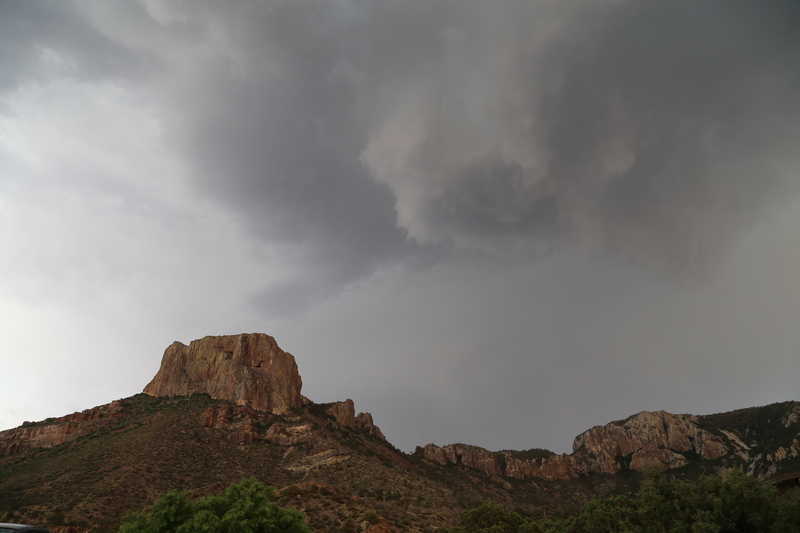 Thunderstorm forming over Casa Grande peak in the Chisos Mountains. As you might expect in the desert, finding water is an unlikely prospect, so plan to carry all that you will need. Even if you happen to find water (like the Rio Grande River), it is most likely contaminated. Given the low humidity (10% or less) dehydration is a serious concern even in cooler weather, so carrying one gallon (4 liters) of water per person for a longer day hike is not unreasonable. Don’t forget the sunscreen, a hat, and proper clothing to protect you from the sun’s damaging UV rays, either. A final note of caution that I cannot overemphasize, there is no cell service anywhere in the park and only spotty service on the main roads within 100 or more miles of the park, depending on which direction you travel. If you get lost while hiking or breakdown driving in or around the park there is no way to call for help unless you happen to have a satellite phone, which I suspect most people, myself included, do not. Traffic can also be very sparse, especially in the off-season, so your wait time for assistance from someone just passing by could be significant. Be aware, be prepared, and plan accordingly! One lesson we have learned from past trips to national parks is that staying in, or very near, the park has many benefits. Saving drive time to reach trailheads and being in close proximity to scenic spots for morning and evening photography, are two big ones. On this trip I did not even bother to research any lodging options outside the park due to the remote location. We chose to stay at the Chisos Mountain Lodge and were very pleased with the accommodations, the staff, and the food in the restaurant. Wi-Fi service is available in the lodge, so you do have a means to communicate with family and friends. The park store in the Chisos Basin is well stocked with all the necessities and the prices seemed reasonable, though we brought everything we needed with us as we did not know what to expect. There are also three developed frontcountry campgrounds in the park as well as backcountry camping options that will require a permit. The NPS website describes several day hikes of varying difficulty in three primary regions of the park, desert, mountain, and river. Our main hikes were in the mountain and river areas, though we did check out a couple of the old ranches (Sam Nail Ranch and Homer Wilson Ranch), the Hot Springs Historic Trail, and a number of the scenic overlooks in the desert area, though these did not qualify as hikes in my book as we were never more than a few hundred yards from our vehicle. 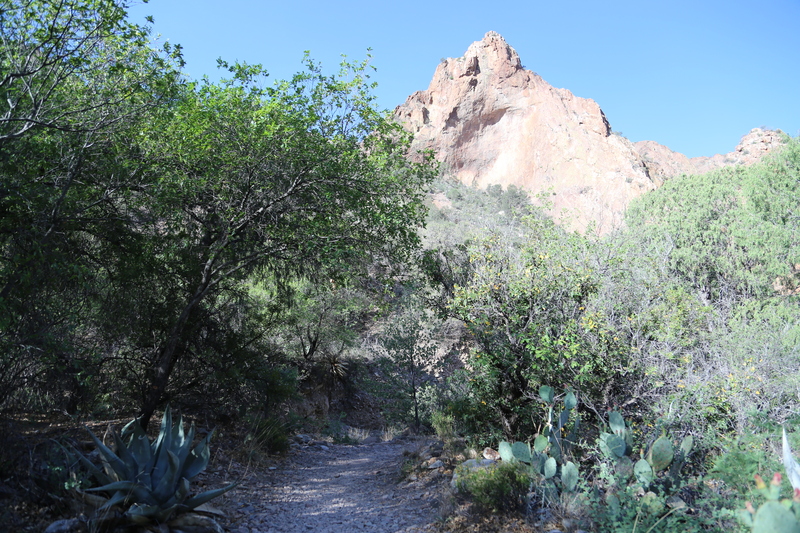 Trailhead behind the Chisos Mountain Lodge for the Window Trail. Our first hike was the Window Trail. 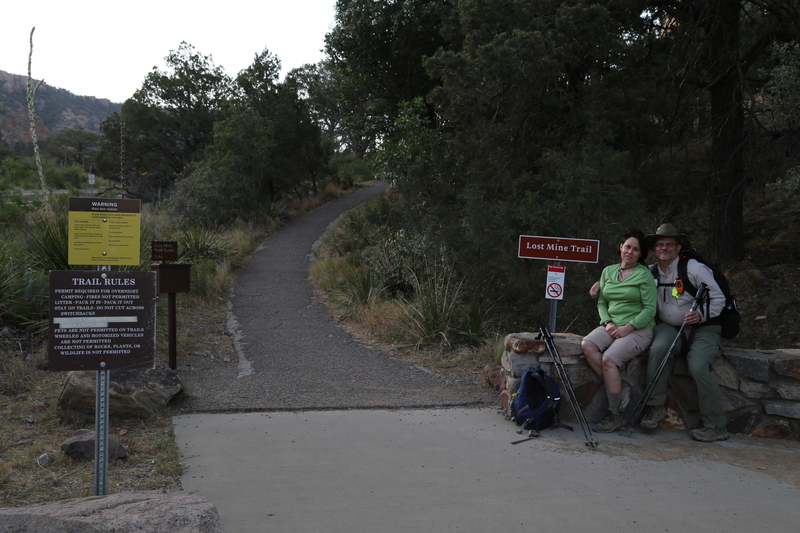 The trailhead is directly behind the Chisos Mountain Lodge where we stayed. Out the door and onto the trail, how much better can it get? This is a moderate 5.6 mile round trip hike that is all downhill on the way out and all uphill on the way back. This configuration did make it a little more challenging at the time of year we were there as the temperatures were over 90 °F by the time we finished the hike. This is a good hike to start with and the view at the end of the trail is amazing. There will be no doubt when you have reached the end of the Window Trail! Trailhead for the Lost Mine Trail (the trail is only paved for a short distance). Our second hike was the 4.8 mile round trip Lost Mine Trail. This is another moderate hike, but is has an opposite configuration to the Window Trail as it is uphill on the way out and downhill on the way back. 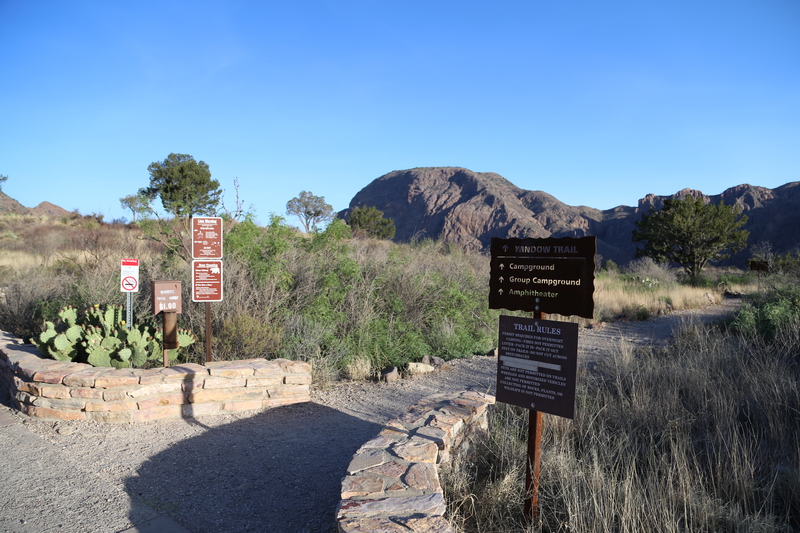 The trailhead is less than two miles from the Chisos Mountain Lodge, so it was easy to get an early start on this trail, as well. The views along this trail, and at the top, make it well worth the time and effort. View of the Chisos Basin, Casa Grande, and the Window along the Lost Mine Trail. View looking south at the end of the Lost Mine Trail. 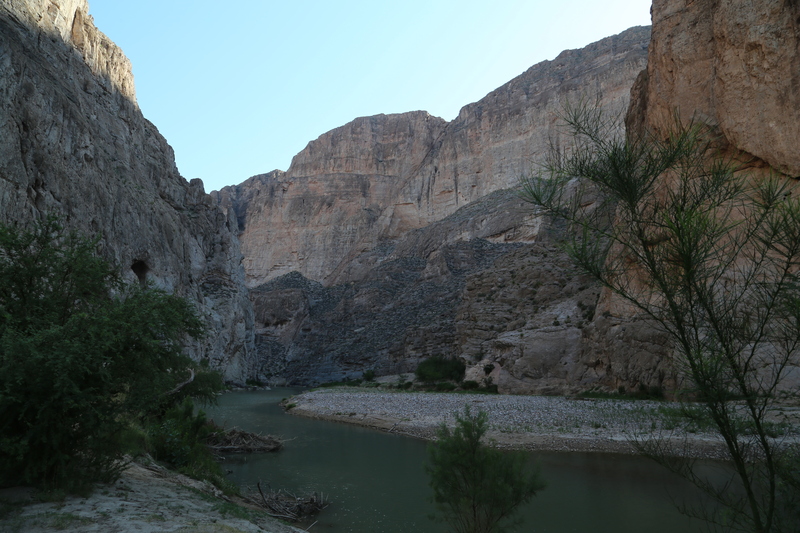 At the far ends of the park are two incredible canyons of the Rio Grande River, Santa Elena canyon on the west end and Boquillas Canyon on the east end. 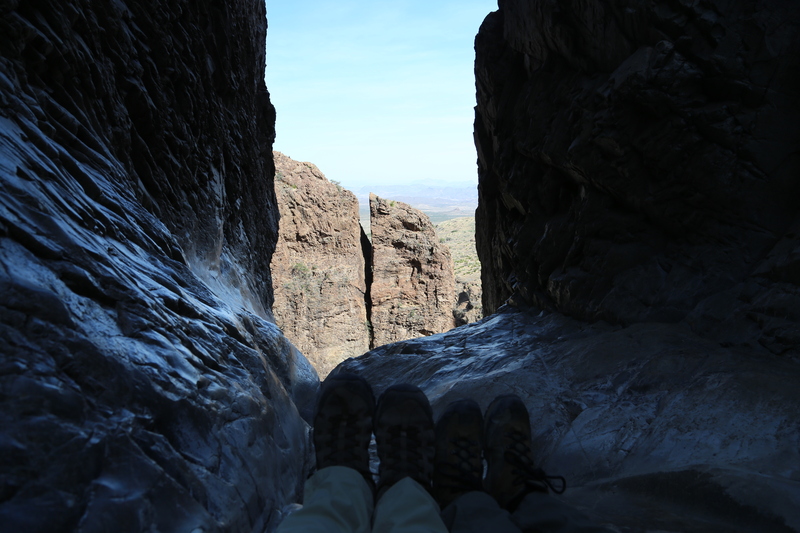 While the hikes into both canyons are short and relatively easy, about a 1.5 mile round trip for each, they are iconic of Big Bend, and a must do. 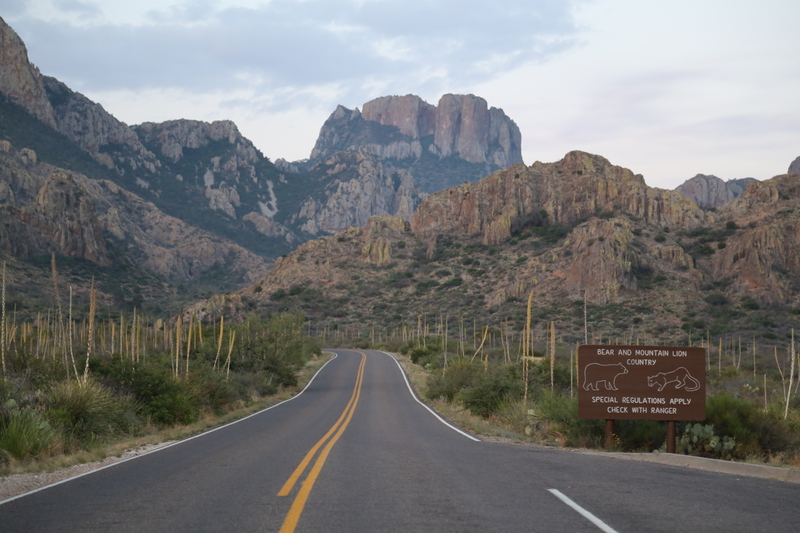 These destinations require drive time if you are staying in the Chisos Basin, so plan accordingly and enjoy the rugged desert scenery along the way. One other note on these two trails is to make sure you listen for the call of the canyon wrens which were a common sound on both hikes. 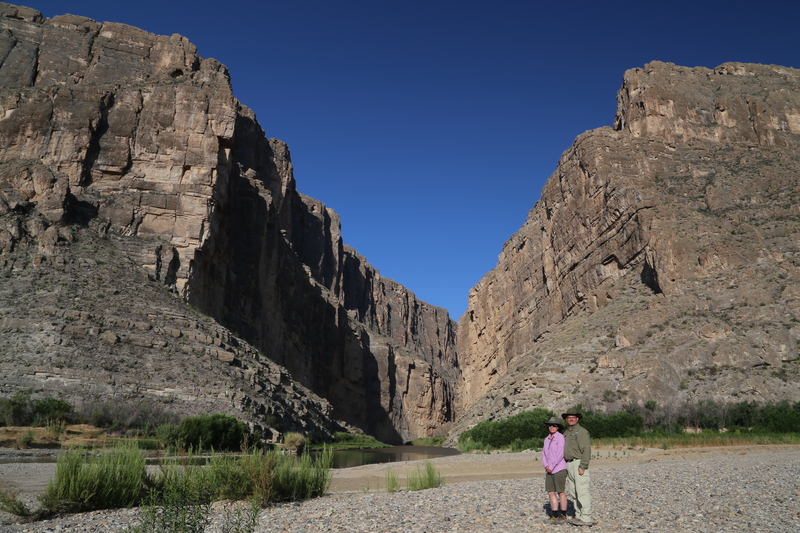 Standing at the entrance to Santa Elena Canyon. 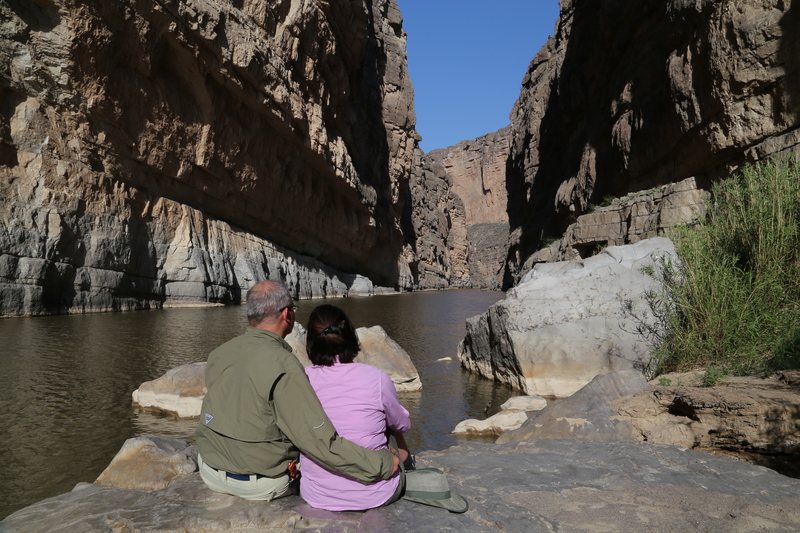 Enjoying the view inside of Santa Elena Canyon. Do not be surprised in Boquillas Canyon if you are approached by locals from the village of Boquillas, Mexico who commonly wade across the Rio Grande River to sell souvenirs in this area. You can be fined for purchasing these trinkets as they have not been properly imported. There is a legal border crossing nearby, but you will need your passport if you want to visit Mexico to do any souvenir shopping. 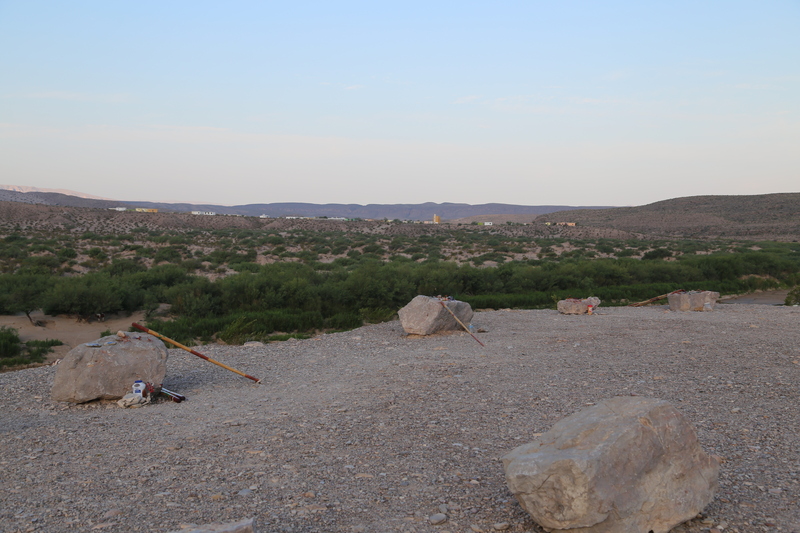 The village of Boquillas, Mexico in the distance and some of the local wares for sale on the rocks in the scenic overlook parking area near the Boquillas Canyon trailhead. Like any national park we have visited, there is a massive amount of information on the NPS website for Big Bend, and I recommend taking the time to do some research before you go. Also, even though it is one of the least visited parks in the park system, be sure to make reservations well in advance so you are not disappointed when you arrive, especially if you plan to travel there during the peak season between November and April. 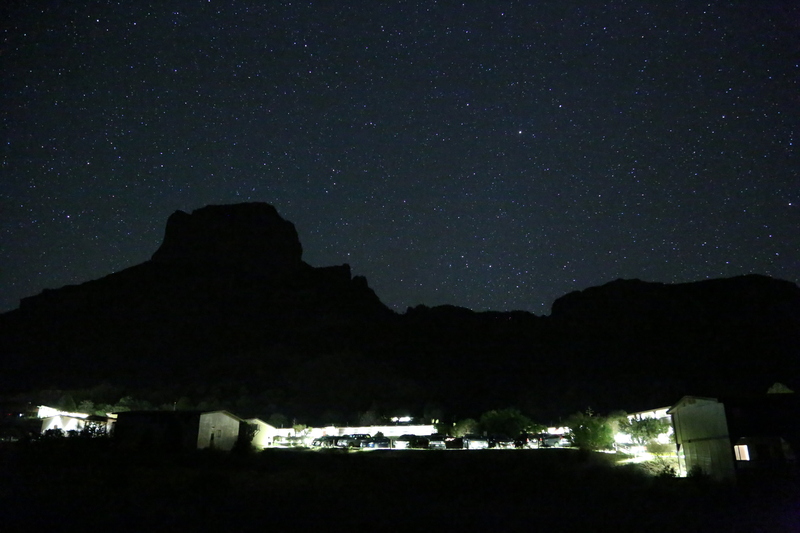 Stars over the Chisos Mountain Lodge with Casa Grande silhouetted on the skyline. This entry was posted in HIking Destinations and tagged Big Bend National Park, Big Bend NPS, Boquillas Canyon, Chisos Basin, Chisos Mountain Lodge, Chisos Mountains, Deep in the Heart of Texas, Desert Hiking, Hiking, Lost Mine Trail, Rio Grande River, Santa Elena Canyon, Sunrise, Sunset, Texas, Window Trail by Todd D. Nystrom. Bookmark the permalink. It is well worth the trip if you have the opportunity!